Scoop up your friends and family members & come over to view and shop the inventive work of 8 established fellow artists. Photographer Lisa Lardy founded this festive event by disguising her home as an art gallery & inviting neighborhood friends & assorted pals to drop in for refreshments, visiting, & shopping. Jeweler Bridget Clark became our host three years ago, but the beat goes on—as powerfully as ever—as we celebrate our 10th-annual artful show and sale. Lisa is baking a cake, and we’ll all be there to welcome you! Saturday, November 11, 2017, from 10 a.m. to 5 p.m.
We’re cross-pollinating our event with the Nokomis Urban Craft & Art Fair from 9:30 a.m. to 4 p.m. on the same day. Around 40 artists will show & sell their work at the Lake Nokomis Community Center, 2401 East Minnehahs Parkway, Minneapolis—just a mile from our event at Bridget’s home. Pack your vehicle with pals and soar across the border to western Wisconsin where you can joyfully tour 17 inspiring art studios and galleries. I will be at site 12 with family—my inventive step-brother John who can build or fix anything and his creative wife Kaye whose talents in anything artistic, musical, or related to hospitality are boundless. Stop by to enjoy Kaye’s paintings and ceramic wonders, Pat’s jewelry, Mark’s raku, and my nature prints. 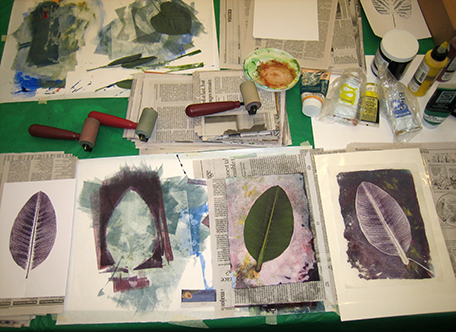 Print a leaf, make a raku piece, shop, relax, and have something to eat and drink. The chickens will roam, the flowers will bloom, the wind will blow, and the portable toilet will have time for you. The front of the brochure for the Fresh Art Studio Tour, fall 2017. 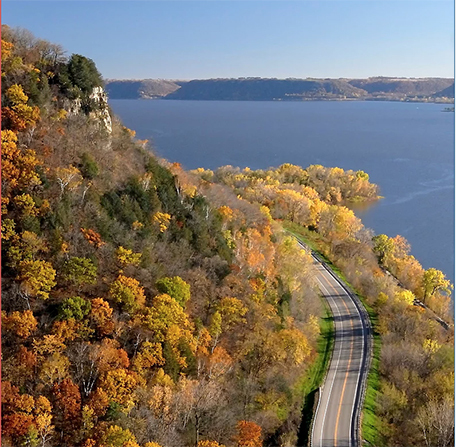 The photo from the Fresh Art Studio Tour website—the glorious Mississippi River valley, looking south along Wisconsin highway 35. What it’s like, for me, to write in the early morning. The inspiring advice I recorded in my journal is from the late poet, Jane Kenyon. I’ve gained lessons from Dee and Dave – to not take anything for granted, but rather to be grateful. Also to be grateful for the things that don’t go my way; for challenges and stressful circumstances, knowing I will learn something from them, if only I approach those times with an outlook of gratitude. During Hurricane Irma, and during these days following that destructive event, I am grateful to live in the Midwest, away from the devastation of tropical storms. But my sister and her husband live north of Naples, Florida. If anyone can come through a catastrophe, my vote would be solidly for them. They are prepared for any eventuality and they work well together. Now, when they are among the 7 million Floridians who don’t have electricity, the good news is that they are tired but well, and although there’s flooding outside their home, inside it’s dry. I’m so relieved; so grateful. But I feel guilty that our electricity works, our water is clean and available, our streets are clear of debris, and stores and offices continue to operate in a “business as usual” model. I also feel helpless and inadequate. Beyond donating to the Red Cross, I wonder what to do that would be helpful. Perhaps I can answer my own question by being grateful, and recognizing all that I have for which I can express gratitude. 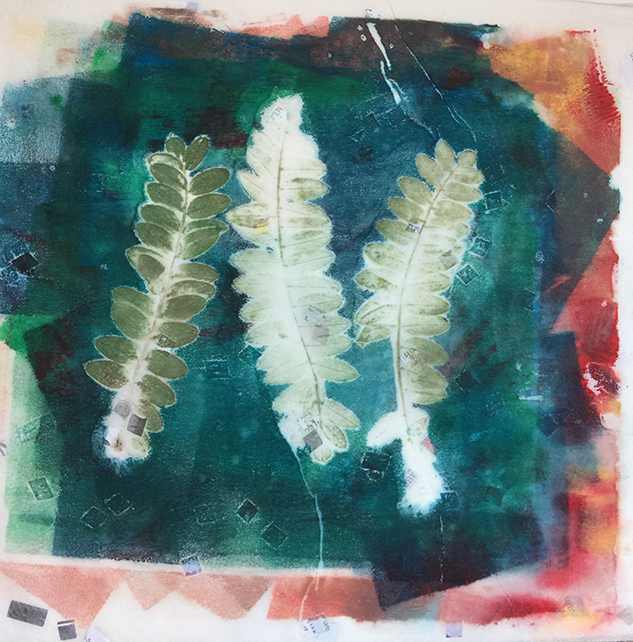 Instead of placing one piece of paper on the inked palette, I grabbed three scraps & laid them in place over the inked palette & Ostrich fern leaves. As I was vacuuming up dust and dead bugs on our porch, I thought about how we spend our time. Housekeeping and life’s daily chores are necessary, and can even provide a contrast to the more challenging activities in life. In fact, more than one artist has written about deriving comfort and time for reflection from the doing of life’s ordinary tasks. But if you are a maker—a creator of something that didn’t exist before you started your creative process—keep at it. Your “making” of something is making a difference, surely for your own satisfaction and joy. 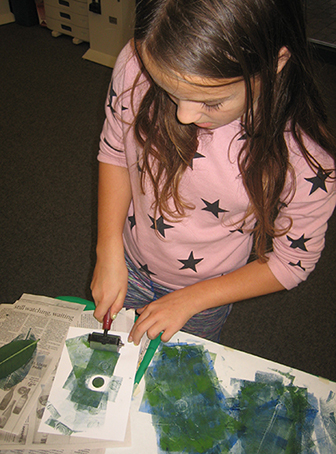 It was a wild time at the nature-printing demo and sale yesterday at the library. If you made time to stop by, thank you. If you kindly purchased some of my note cards, please know I really appreciate that. And if you bid on a print, or purchased a print—yes, some of the 8×10 matted prints sold!—I am honored and grateful. The two volunteer Friends of Washburn Library sold more of my work (not counting the auction bids) than during the three previous years the library has hosted the demo and sale. I attribute this to your support & enthusiasm, and also to savvy librarian Gloria, who posted a note on Nextdoor (a neighborhood-centric social media platform). Several people arrived at about 10:40 in anticipation of the 11 a.m. demo. They received extra credit for watching, and helping, me set up. As for the demo, I wish I’d thought to have the video capability on my phone or camera engaged when people pulled their first prints. The crowd of 10-12 people made a spontaneous “Ahhh” sound. It was really fun. People made very nice prints. More adults than kids printed yesterday. Usually it’s the other way around at the library. Most people start with the minimum bid, which frequently becomes the only bid. Thus I sold quite a few prints for $15—which I was prepared to do. Works sold quite ecumenically, i.e., works I really like as well as those I don’t, all sold. 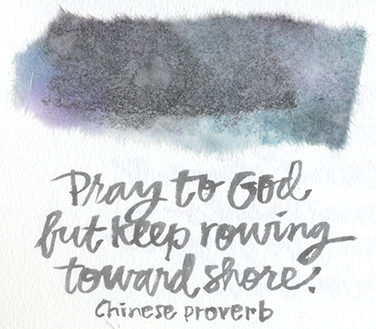 This is a lesson for me in letting go. We talk about this during yoga practice, but actually allowing one of your “children” (prints) to go to a “good home” takes some resolve. One work had a bid of $20. That dismayed me. It’s not my favorite work, but technically it’s the best. It’s also done in a style I no longer do and don’t plan to resume doing. What did I do? Bid $25. I will pay the library $12.50 for my own work, but I will keep that one for myself. Another good lesson learned. One print had four bids, from which I learned which piece, of all of them, appealed to the most people. I will bear that in mind as I go forward with my creative pursuits. Shown here is the work of Lisa, an enthusiastic—and artistic—kindergarten teacher in an environmental school within the Minneapolis Public Schools system. 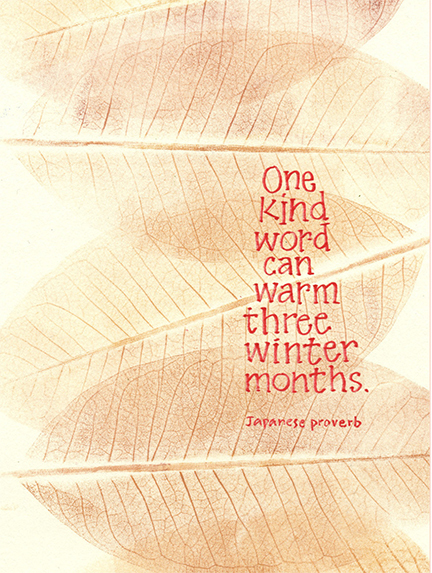 The beautiful leaf is common milkweed on which Monarch butterflies lay their eggs. This Saturday, August 19, 2017, please stop by the Washburn Library in south Minneapolis to print a leaf to frame—or stick to your refrigerator! The fun runs from 11 until 2. In case you’ve got any cash left over from enjoying nearby farmers’ markets, my note cards will be available at $3 each or 6 for $15. And, the framed prints on exhibit in the library are all part of a silent auction that ends at 2 p.m. Sizes range from 10×13” to 16×20”. The minimum bid is $15. All money from sales will be shared equally between me and the Friends of the Washburn Library. They, along with librarian Gloria Olson, make this event possible. If you’re booked this weekend, please put these other creative events (listed below) on your calendar for the coming months. Saturday, Dec. 9, 9:30 a.m.–4:30 p.m.
My blog was hacked. Thankfully, a friend notified me so my husband could work with our internet service provider to delete foul, disgusting images and columns of comments in French. Also removed were two years of posts due to my not knowing—or forgetting—to back up my posts. Believe me, I am wiser now. Meanwhile, let’s go forward to the next event about which I’m all perked up. It is Paul and Susan Damon’s 10th garden tour and art sale at their dazzling, pollinator-friendly garden and home. Dates are Friday, July 14, from 5–8 p.m., and Saturday, July 15, from 11 a.m– 5 p.m. Their address is 355 Cleveland Avenue North in St. Paul, Minnesota. 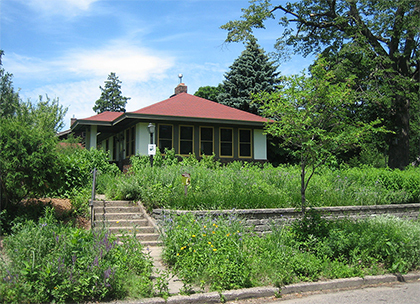 Their 1920’s bungalow is located just slightly east and north of the Lake Street bridge that crosses the mighty Mississippi River. Paul’s compelling, mostly landscape paintings will beckon you from their posts throughout their home. Susan will lead you through an impressive and artistic array of native plants in their bountiful garden that was designated as a Monarch Waystation more than 20 years ago. 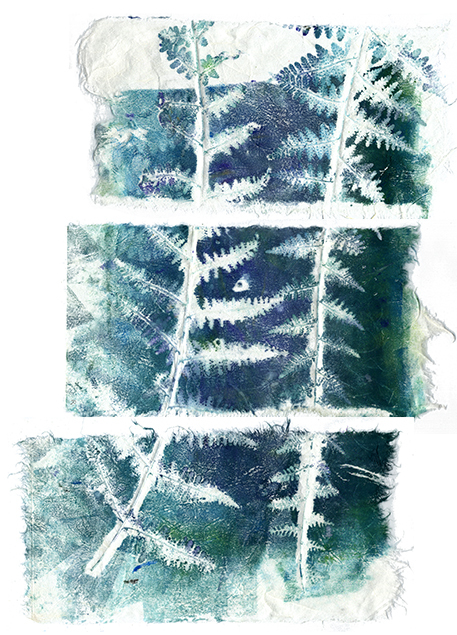 My original nature prints and note cards will be for sale in the cool shadow of Damon’s garage where you can also print a plant and take the print home to frame, or proclaim as refrigerator art! 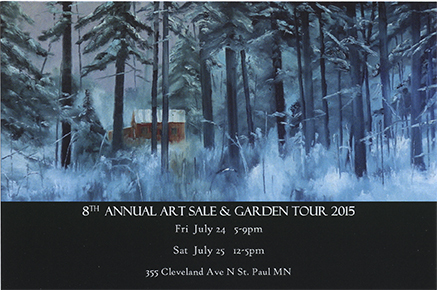 Here’s a quote from Paul and Susan’s postcard about the art sale and garden tour: “Dogs welcome. Your family and friends, too. Come and help us celebrate our tenth year.” Please stop by! Paul and Susan’s home and garden, the site of their 10th-annual Art Sale and Garden Tour.